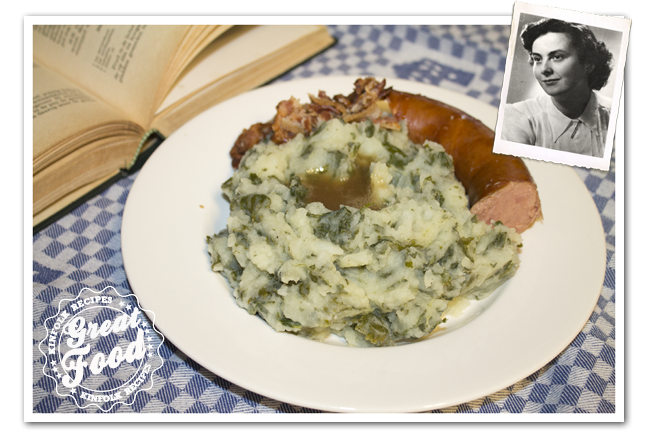 Boerenkool Stamppot (kale hodgepodge literary translated farmers cabbage hodgepodge) is a Dutch dish of mashed potatoes mixed with kale. 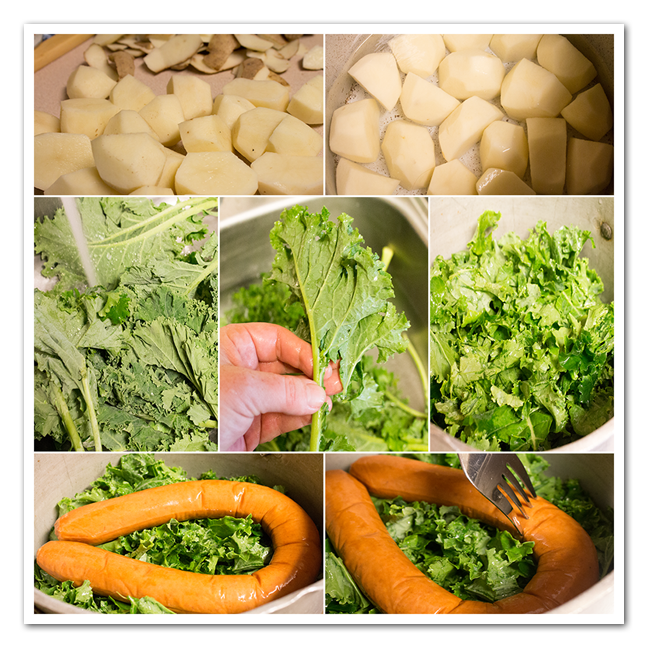 There are sometimes other vegetables mixed into Stamppot, like sauerkraut (zuurkool stamppot), raw endive (andijvie stamppot)or carrots (hutspot). It is commonly served with a smoked sausage (rookworst), spekjes (bacon), pickled baby onions and gherkins. 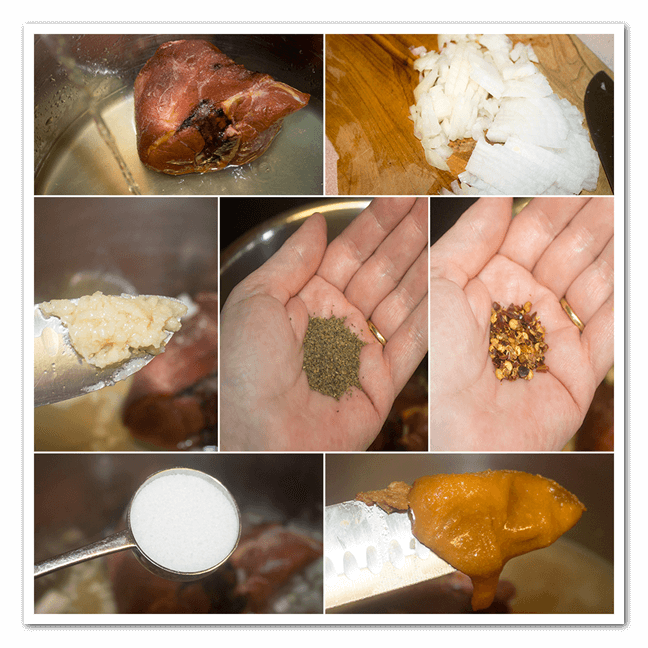 It is also tasty with a small “pond” of brown gravy in the center of the vegetable mixture. 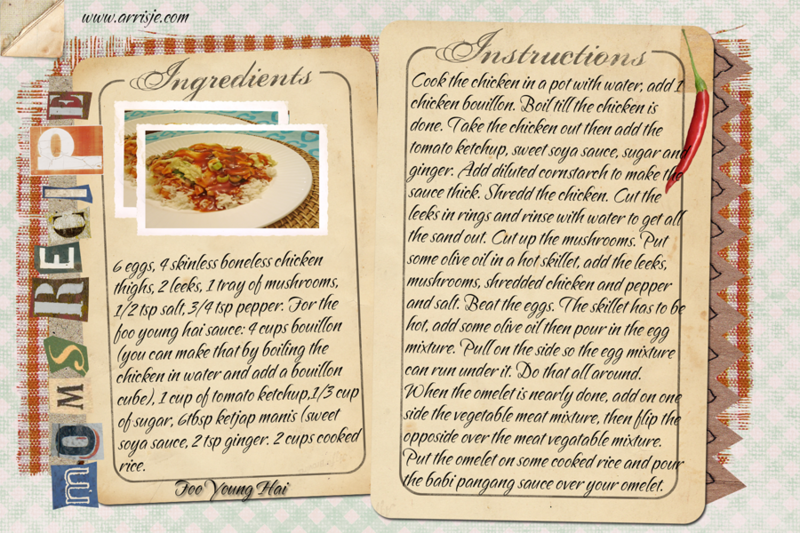 This simple but yet so delicious recipe I got from my dear mom. I can’t ask her no more: “Mom how did you make it?”, that’s why this recipe book is a true treasure to me. At the moment one pot dishes seems to be in “style” like one pot pasta’s. Stamppot have been around in the Netherlands like forever, you could say one of the first one pot meals ;). At the moment one pot dishes seems to be in “style” like one pot pasta’s. Stamppot have been around in the Netherlands like forever, you could say one of the first one pot meals ;).The stamppots are primarily served as a cold-weather dish, though some varieties are eaten year round. Dutch habit is that you don’t make no boerenkool till it has been freezing temperatures. The starch in the leaves is converted by the freezing temperature into sugars, which makes the taste of kale sweeter. Peel the potatoes cut in halves, Was the Kale good make sure their are no caterpillars left on the leaves. Cut or tear the kale in small pieces, take the vein out . Put the potatoes in a pot, cover with just enough water. Add the kale, top it with the smoked sausage. Pierce the smoke sausage. Bring to a boil, then cook on medium high for about 20-30 minutes till all done. Take the smoked sausage out of the pan. drain and mash the kale and potatoes. Add the butter and warm milk. Add pepper and salt to your taste. Serve with the smoked sausage, crumbled bacon and some gravy. 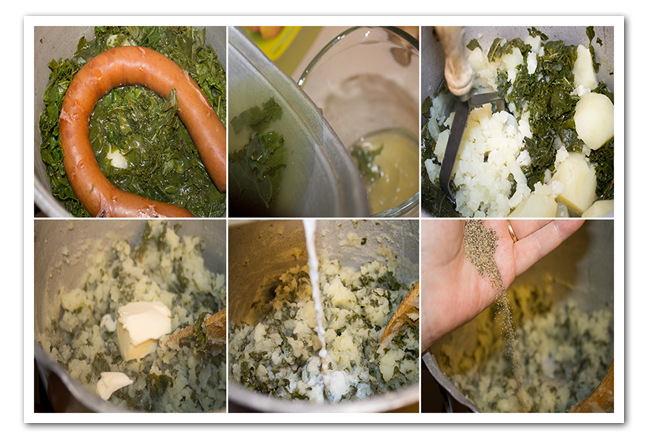 Boerenkool Stamppot (kale hodgepodge literary translated farmers cabbage hodgepodge) is a Dutch dish of mashed potatoes mixed with kale. 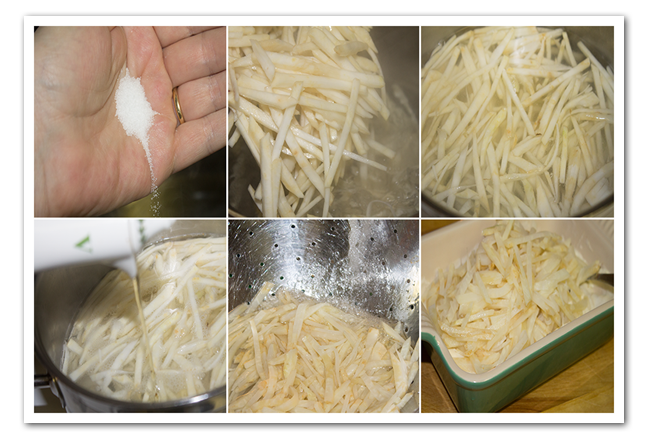 There are sometimes other vegetables mixed into Stamppot, like sauerkraut (zuurkool stamppot), raw endive (andijvie stamppot)or carrots (hutspot). It is commonly served with a smoked sausage (rookworst), spekjes (bacon), pickled baby onions and gherkins. 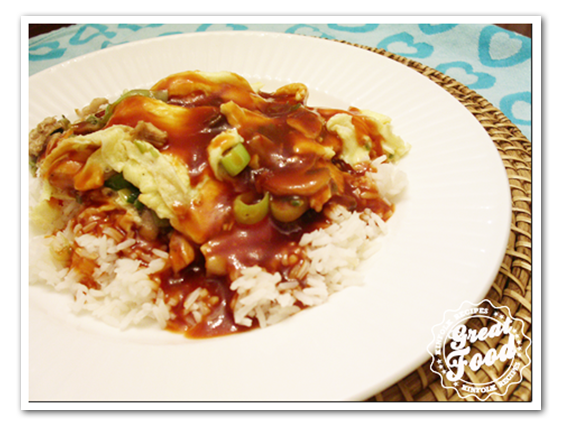 It is also tasty with a small “pond” of brown gravy in the center of the vegetable mixture. This simple but yet so delicious recipe I got from my dear mom. 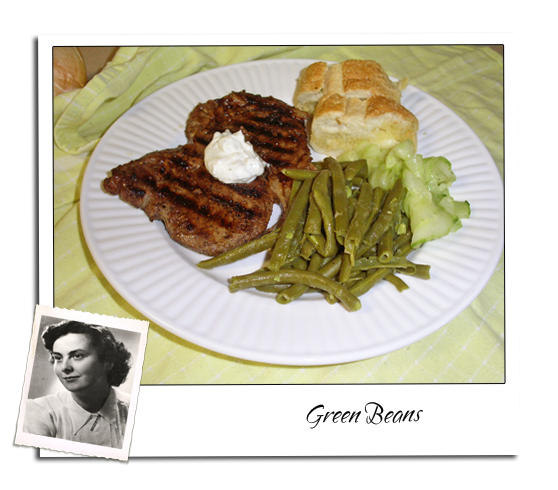 I can’t ask her no more: “Mom how did you make it?”, that’s why this recipe book is a true treasure to me. At the moment one pot dishes seems to be in “style” like one pot pasta’s. Stamppot have been around in the Netherlands like forever, you could say one of the first one pot meals ;). At the moment one pot dishes seems to be in “style” like one pot pasta’s. Stamppot have been around in the Netherlands like forever, you could say one of the first one pot meals ;).The stamppots are primarily served as a cold-weather dish, though some varieties are eaten year round. Dutch habit is that you don’t make no boerenkool till it has been freezing temperatures. 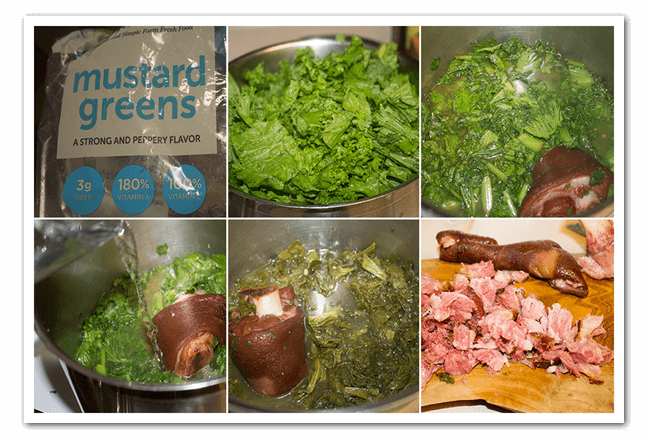 The starch in the leaves is converted by the freezing temperature into sugars, which makes the taste of kale sweeter. 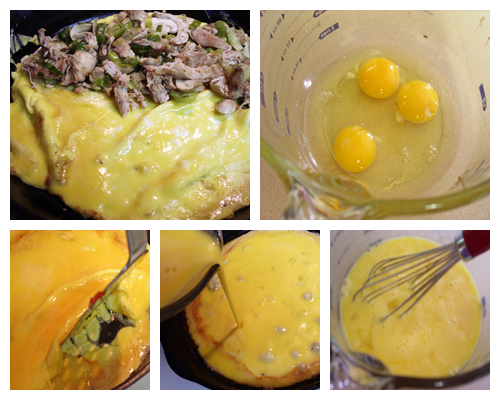 This simple but yet so delicious recipe I got from my dear mom. 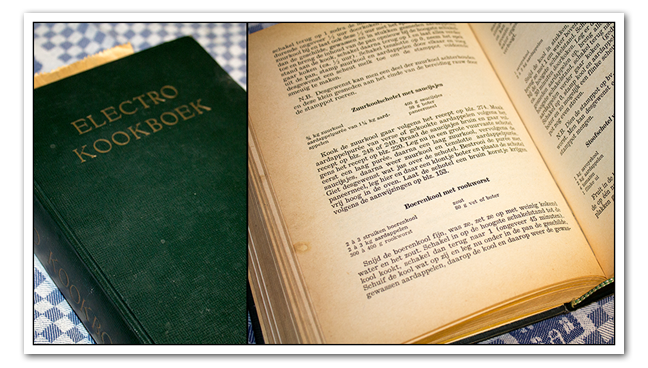 I can’t ask her no more: “Mom how did you make it?”, that’s why this recipe book is a true treasure to me. One thing led to another. I was making a simple macaroni salad and then I had some leftover Pico de Gallo and I thought to my self hmm. How would that taste if I add that to the macaroni salad. And I was right it’s delicious. VegiRoni Salad is one of my favorite salads now. You don’t have to add the Pico de Gallo you can eat it without it to. Your choice. 1/2 lb elbow macaroni, cooked ala dente (7min) that’s a half box. 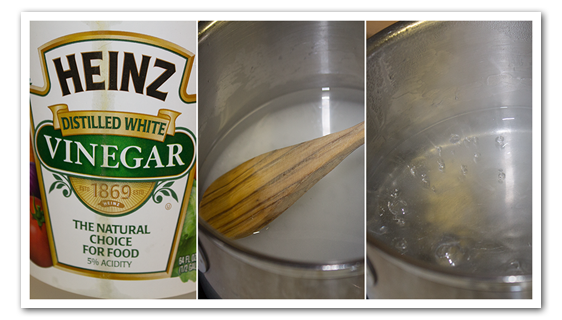 Heat the vinegar and sugar until sugar is disolved. 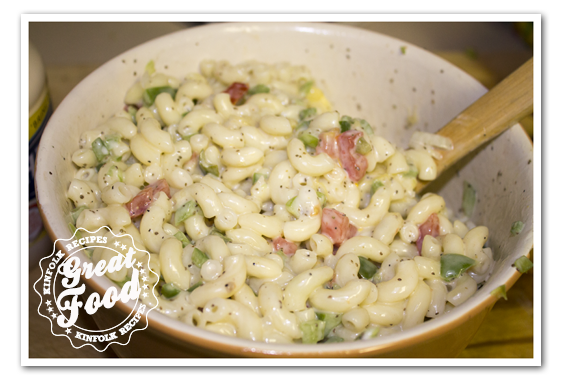 Cook the macaroni for 7 minutes drain and rinse in cold water. 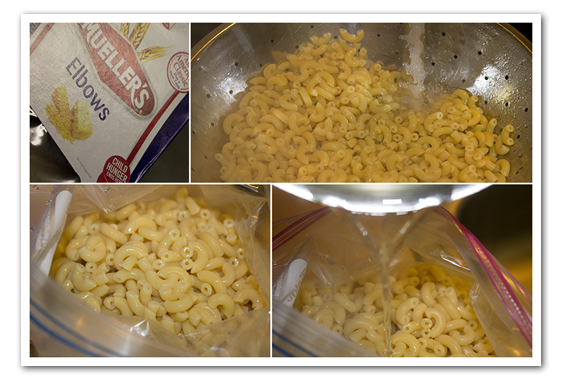 Put the cooled off macaroni in a freezer bag and add the vinegar sugar mixture to the macaroni. 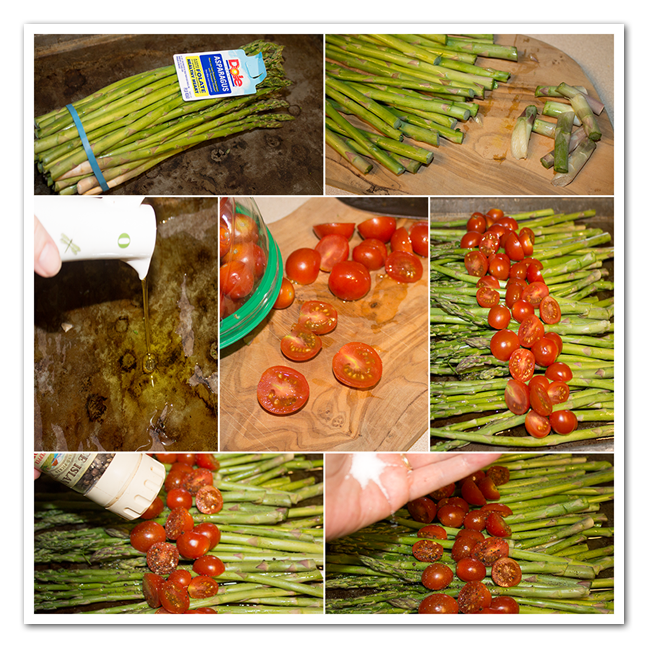 refridgerate in freezer bags for several hours to allow it to set or put it in the freezer for 1 hour. After soaking its possible that there is too much sugar/vinegar mixture, if you find it to be very liquidy you can toss it into a collander for a minute to drain some off. Chop the bell pepper of your choice you can use the green, yellow or red. 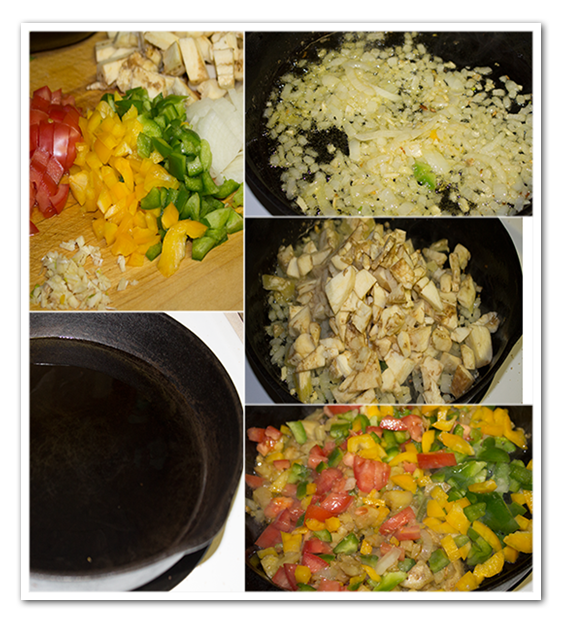 Or make a mixture of all the bell peppers. Add to the macaroni. Then add 1 tbsp celery seeds and 1/2 tbsp black pepper. Add mayo to taste, I use 1 cup. And add 1 cup of prepared pico de gallo. 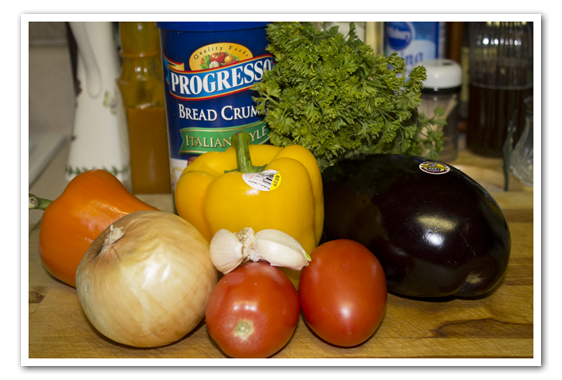 To make the pico de gallo Chop up all the vegetables and fruit, add the lemon juice, pepper and salt. Put in the refrigerator so it can marinate for at least an hour. One thing led to another. 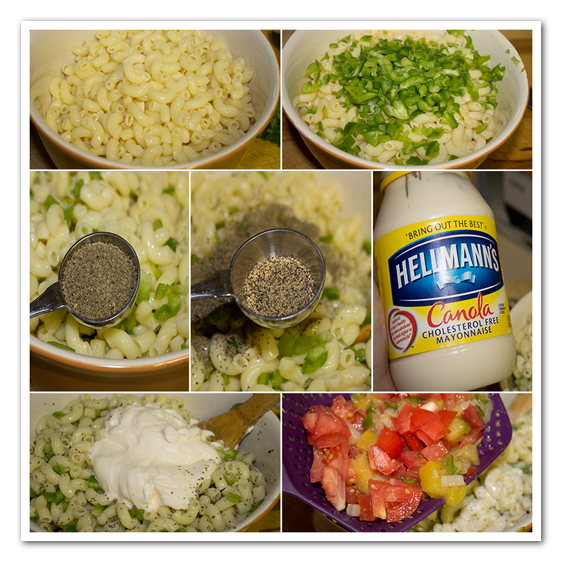 I was making a simple macaroni salad and then I had some leftover Pico de Gallo and I thought to my self hmm. How would that taste if I add that to the macaroni salad. And I was right it's delicious. VegiRoni Salad is one of my favorite salads now. You don't have to add the Pico de Gallo you can eat it without it to. Your choice. 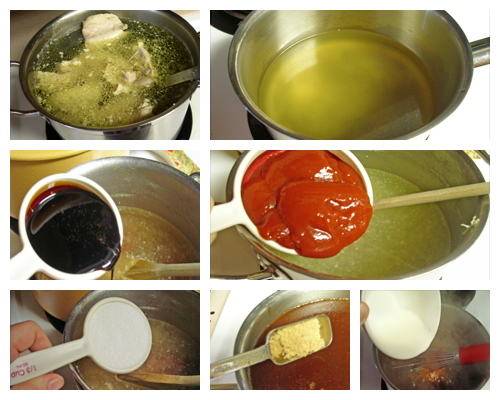 vinegar sugar mixture to the macaroni. refridgerate in freezer bags for several hours to allow it to set or put it in the freezer for 1 hour. After soaking its possible that there is too much sugar/vinegar mixture, if you find it to be very liquidy you can toss it into a collander for a minute to drain some off. 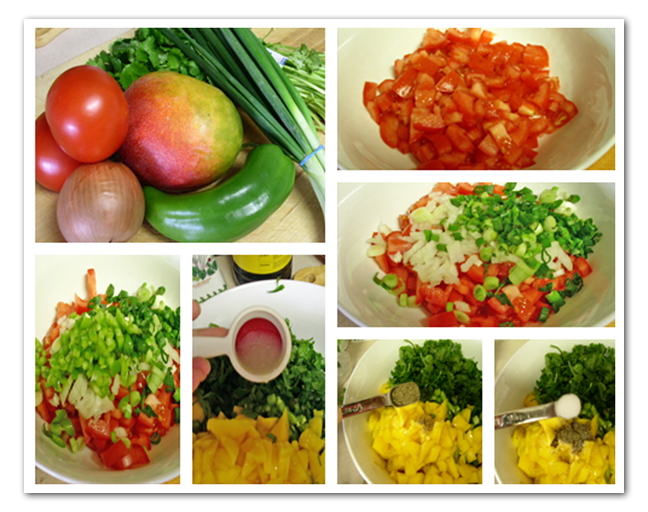 Chop the bell pepper of your choice you can use the green, yellow or red. Or make a mixture of all the bell peppers. Add to the macaroni. Then add 1 tbsp celery seeds and ½ tbsp black pepper. Add mayo to taste, I use 1 cup. And add 1 cup of prepared pico de gallo. Preheat the oven to 350 degrees F. Slice the eggplant in half. 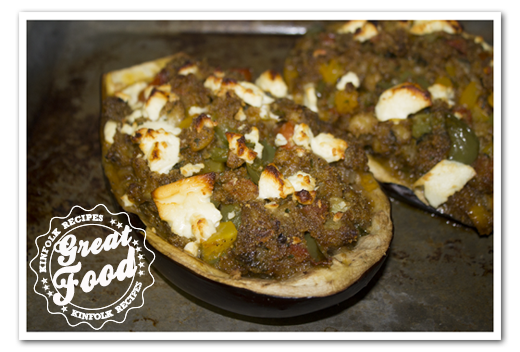 Carefully scoop out the centers of the eggplants, leaving a half-inch shell so they resemble ‘canoes’. Cut the center portion into small pieces, and set aside. Heat the oil in a large skillet over medium heat. Add the onions and garlic, and saute for a few minutes, until tender. Add the eggplant pieces, and cook until soft, about 5 minutes. Then, stir in the tomato, green pepper, and parsley. Simmer for about 10 minutes. Remove from the heat, and transfer to a large bowl. Stir in the bread crumbs until evenly blended. Divide the mixture evenly between the two eggplant shells. Sprinkle feta cheese over the top. Place the eggplant halves on a baking sheet. 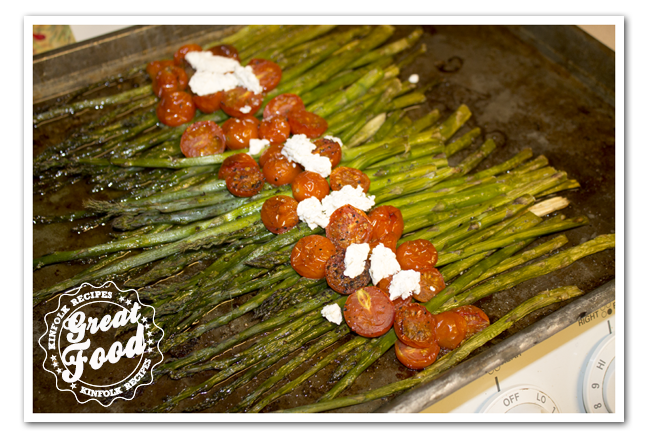 Bake for 15 to 20 minutes in the preheated oven, until the tops are browned. Slice the eggplant in half. 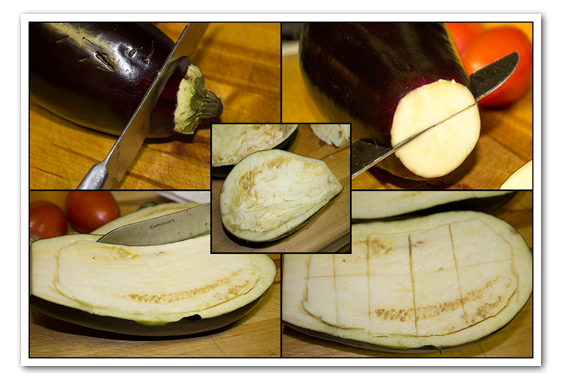 Carefully scoop out the centers of the eggplants, leaving a half-inch shell so they resemble 'canoes'. Cut the center portion into small pieces, and set aside. 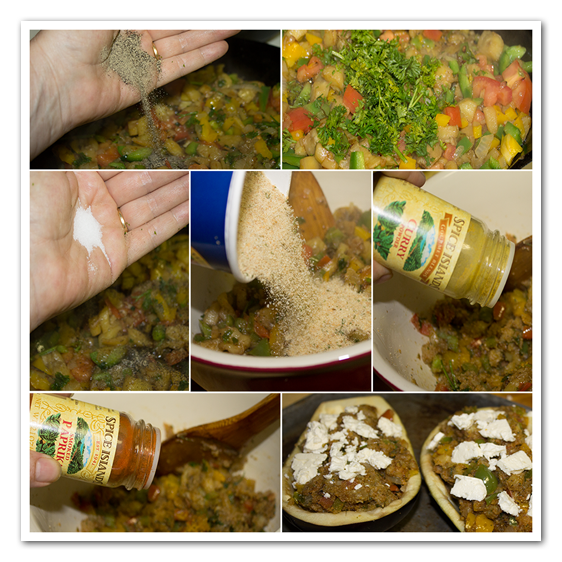 Stofie Bontjie one of my favorite Suriname Recipes. 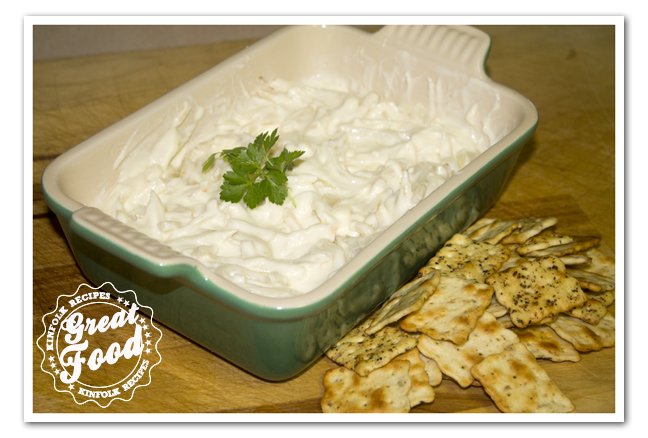 Easy to make and so much more taste. 1. 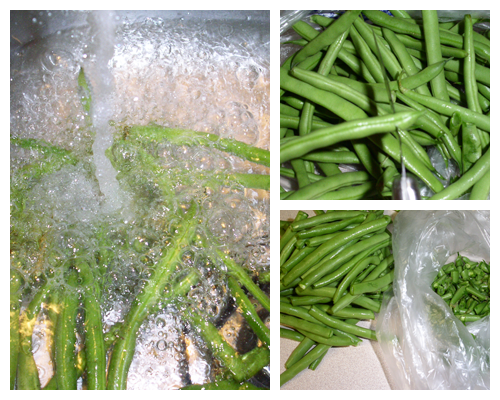 Cut off the ends of the green beans, and wash them. Fry the onion in the butter till translucent, add the cutup tomato and bouillon cube. 2. Add the green beans, and the optional black pepper or sambal. Add 1 cup of water, put the lid on the pot and cook on medium high for 20 min. 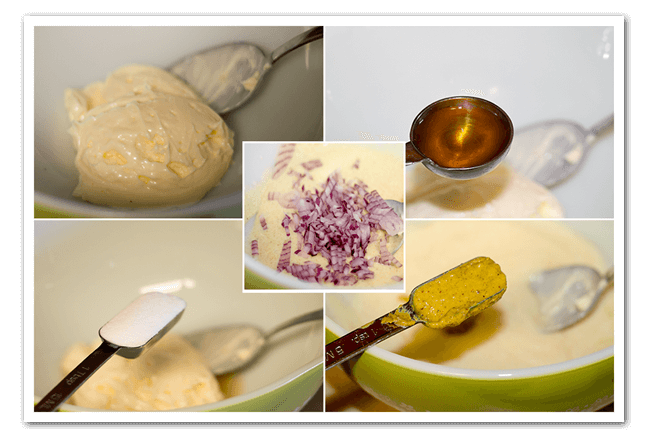 One of my favorite Suriname Recipes. Easy to make and so much more taste. 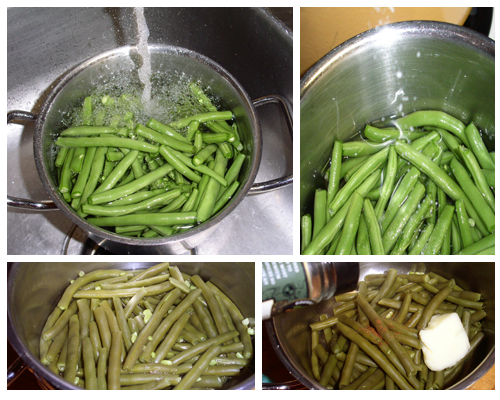 Cut off the ends of the green beans, and wash them. Fry the onion in the butter till translucent, add the cutup tomato and bouillon cube. 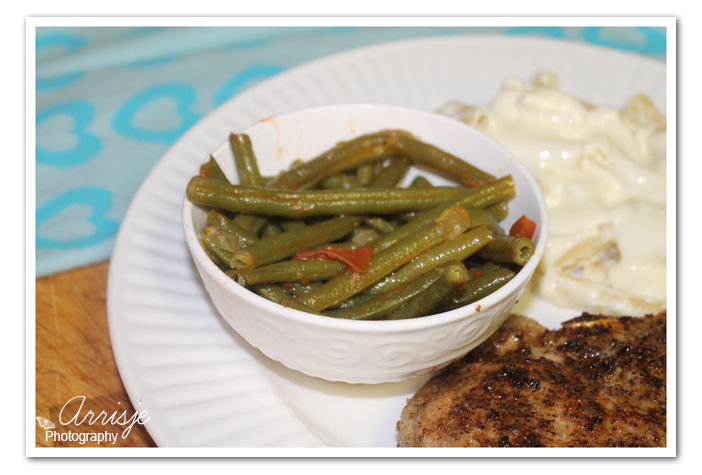 Addd the green beans, and the optional black pepper or sambal. Put the lid on the pot and cook on medium high for 20 min. 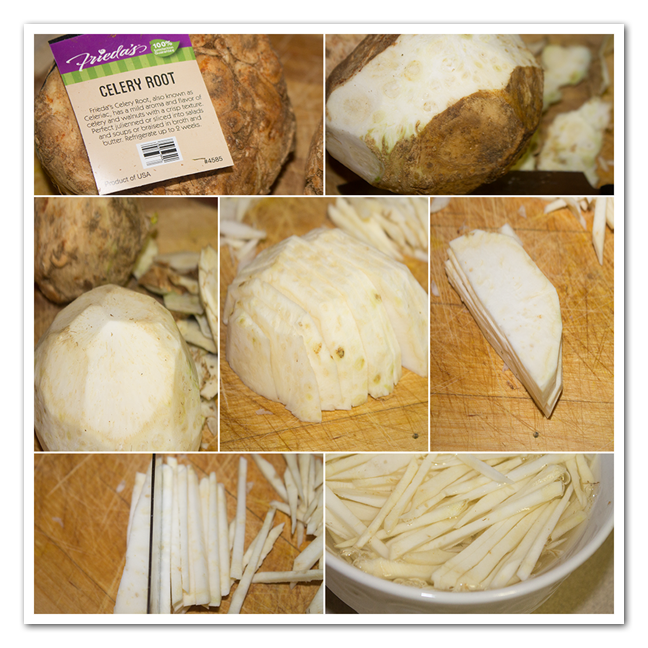 Cabbage is a leafy green biennial, grown as an annual vegetable for its densely-leaved heads. 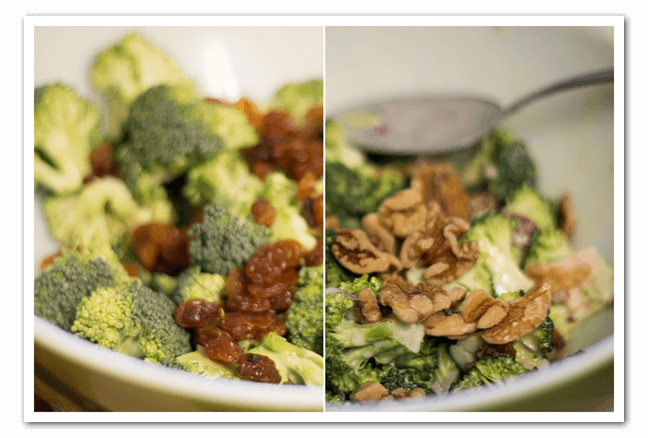 Closely related to other cole crops such as broccoli, cauliflower and brussels sprouts. Cabbage heads generally range from 1 to 8 poundsand can be green, purple and white. It is difficult to trace the exact history of cabbage, but it was most likely domesticated somewhere in Europe before 1000 BC. 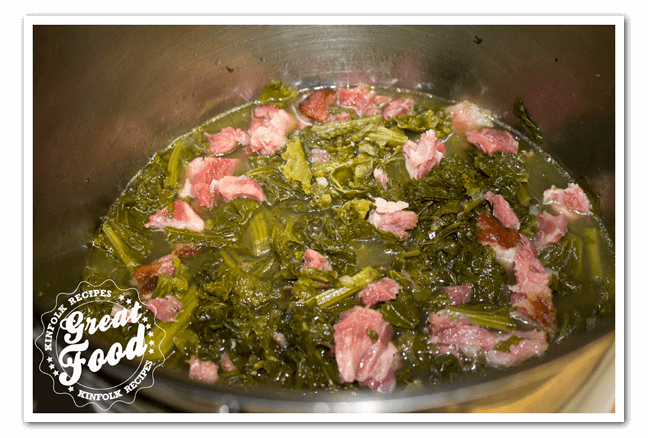 By the Middle Ages it was a prominent part of European cuisine, although savoys were not developed until the 16th century. Cabbage heads are generally picked during the first year of the plants’ life cycles, but those intended for seed are allowed to grow a second year, and must be kept separated from other cole crops to prevent cross pollination. Cabbage is prone to several nutrient deficiencies, as well as multiple pests, bacteria and fungal diseases. Cabbages are prepared in many different ways for eating, although pickling, in dishes such as sauerkraut, is the most popular. Cabbage is a good source of beta-carotene, vitamin C and fiber. If you use salt pork or you may call it fatback. You need to cook it separate in a pot of water, other wise the cabbage will be to salty. 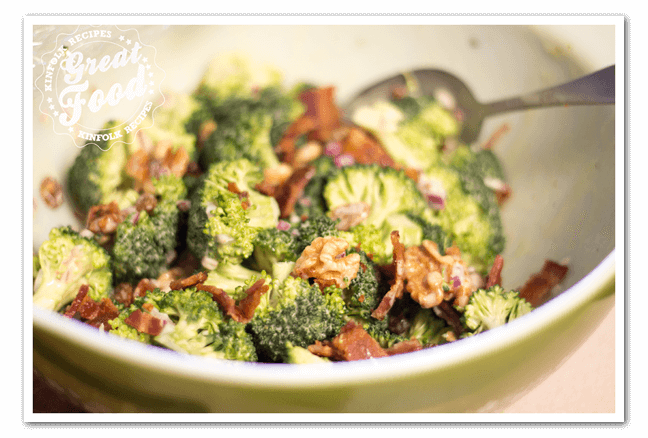 If you use regular bacon you can add it to the cabbage. Cut the green cabbage in 4 quarters and cut the core out. Cut the quarters in half again. Mince the onion and add the cabbage and onion to the water. 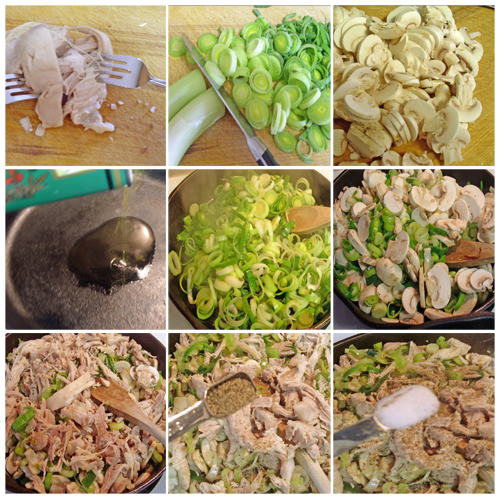 Add the chicken base (if you don’t have that use a bouillon cube), celery seeds, and pepper flakes. 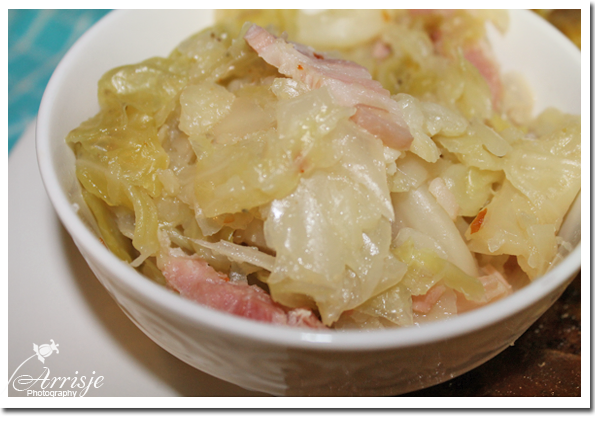 After you cook the salt pork for about an half hour your cabbage should be tender by now. 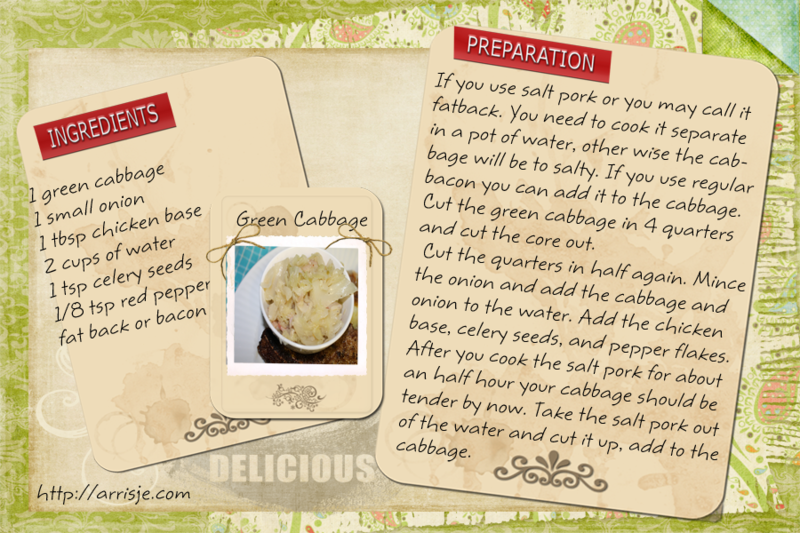 Take the salt pork out of the water and cut it up, add to the cabbage. Cut the quarters in half again. Mince the onion and add the cabbage and onion to the water. Add the chicken base (if you don't have that use a bouillon cube), celery seeds, and pepper flakes. 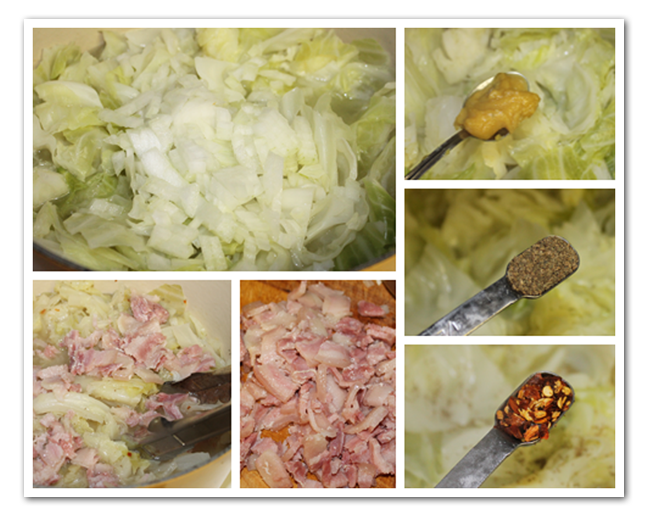 After you cook the salt pork for about an half hour your cabbage should be tender by now. 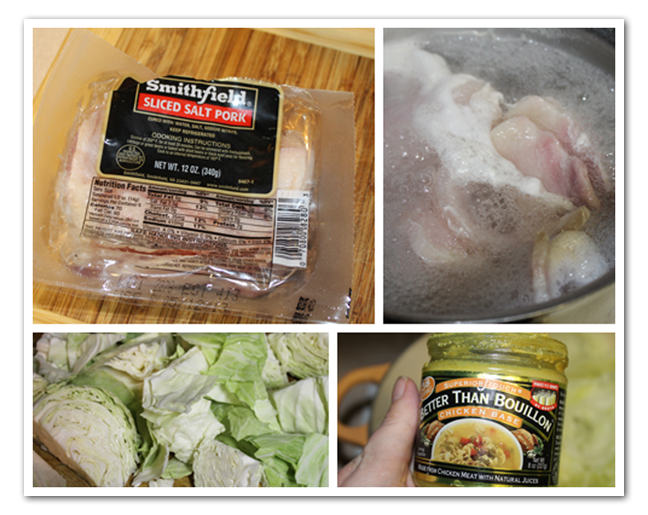 Take the salt pork out of the water and cut it up, add to the cabbage. Remove half of the cucumber skin, leaving thin strips of green all the way around. Cut into quarters lengthwise, remove the seeds and chop. Transfer to a bowl and add the chopped onion, tomatoes, jalapeño, cilantro and garlic. Add the rinsed black eye peas. 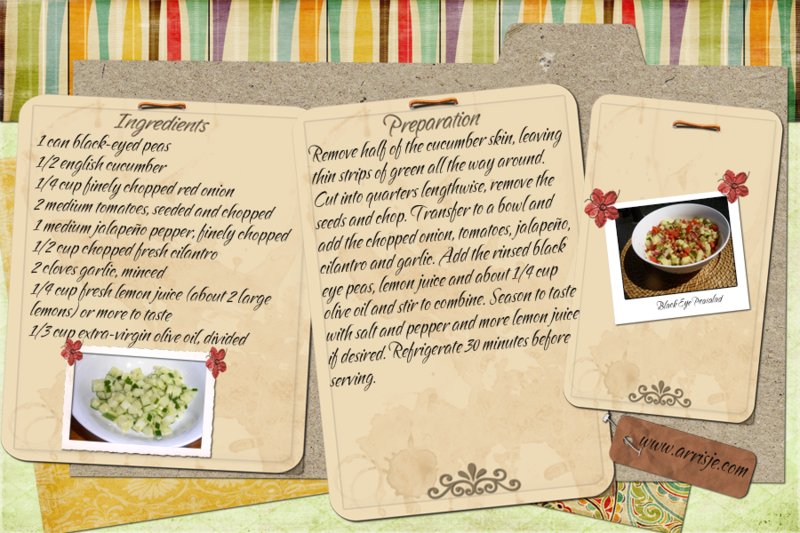 Put the lemon juice and about 1/4 cup olive oil in a separate bowl add salt and pepper and more lemon juice if desired. Refrigerate 30 minutes before serving. Remove half of the cucumber skin, leaving thin strips of green all the way around. Cut into quarters lengthwise, remove the seeds and chop. Transfer to a bowl and add the chopped onion, tomatoes, jalapeño, cilantro and garlic. 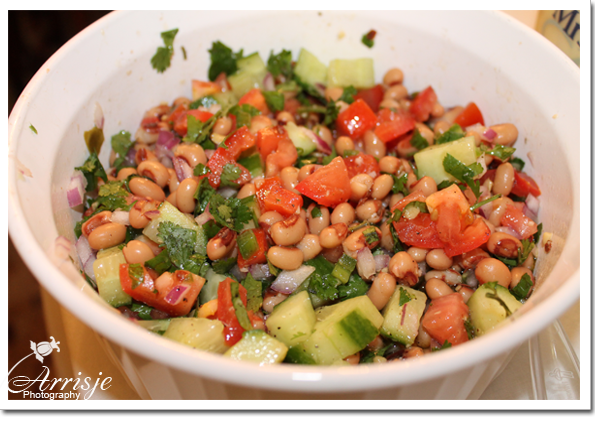 Add the rinsed black eye peas. 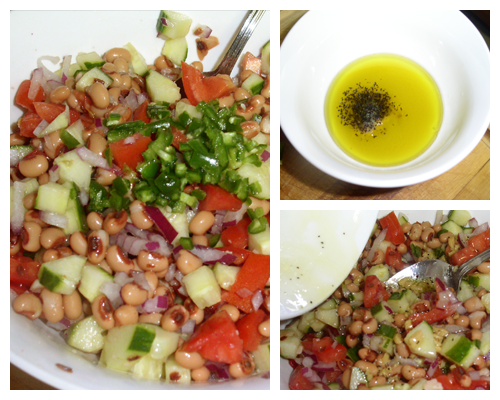 Put the lemon juice and about ¼ cup olive oil in a separate bowl add salt and pepper and more lemon juice if desired. 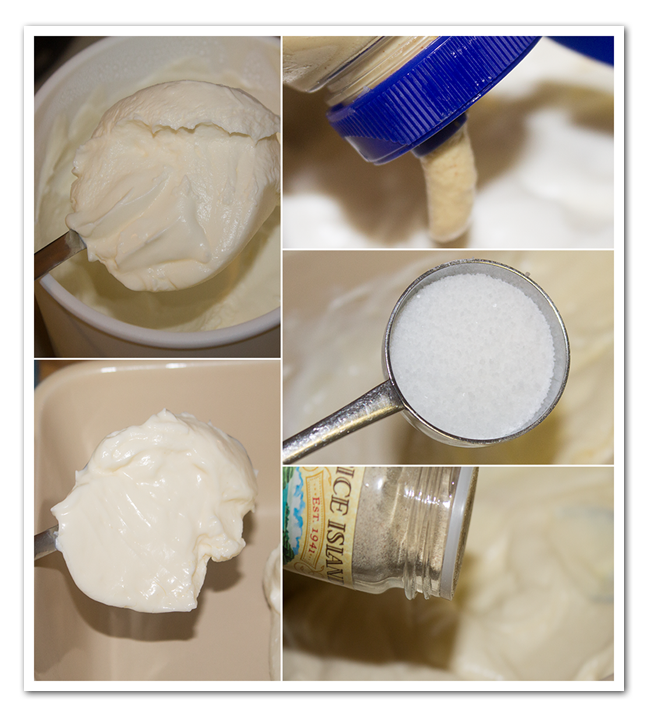 Refrigerate 30 minutes before serving. 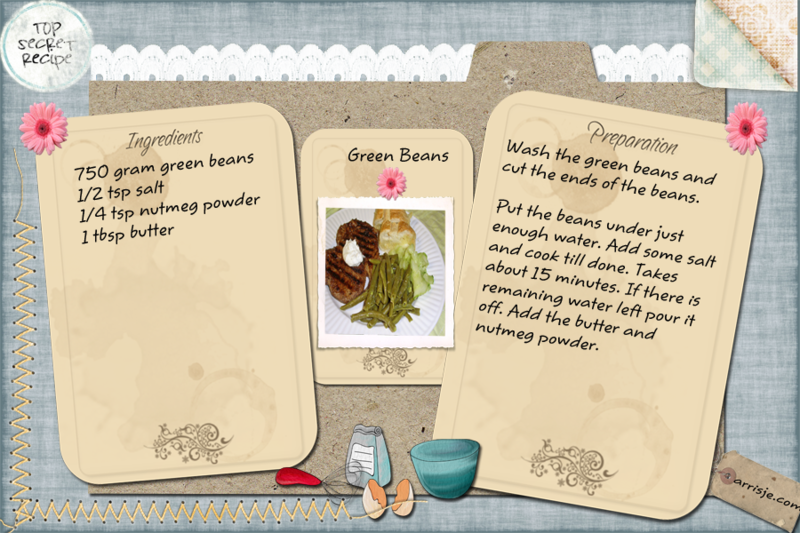 Here is another recipe of my Mother, simple, easy and very tasty. 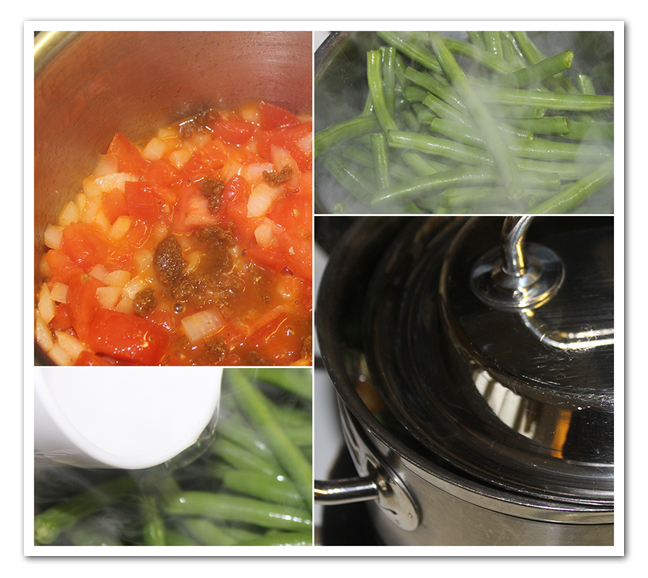 Wash the green beans and cut the ends of the beans. Put the beans under just enough water. Add some salt and cook till done. Takes about 15 minutes. If there is remaining water left pour it off. Add the butter and nutmeg powder.